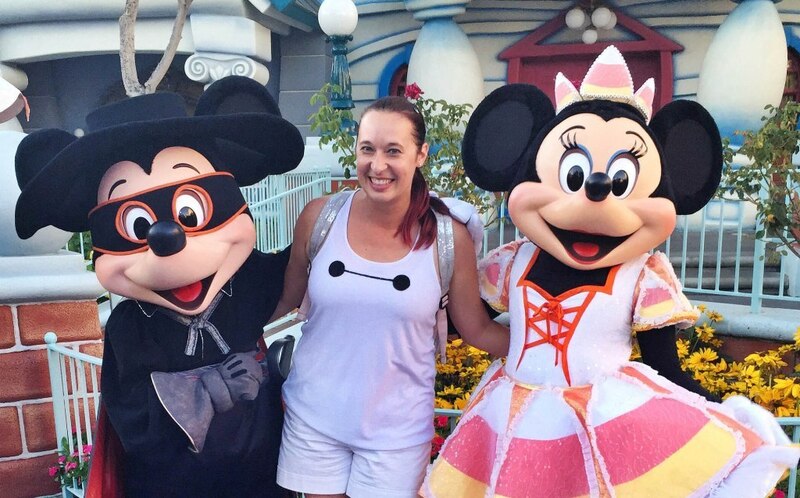 It took years, but I’m finally able to say … I’ve been to Mickey’s Halloween Party at Disneyland! It’s shocking, I know, but this is simply one of those events I just never got around to attending. 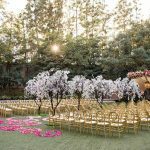 First, for a first few years I was under the impression that the party was geared towards kids – NOT TRUE! Second, I admit it pains me a little bit to pay money for an event ticket when I spend so much on my Annual Passport as it is. 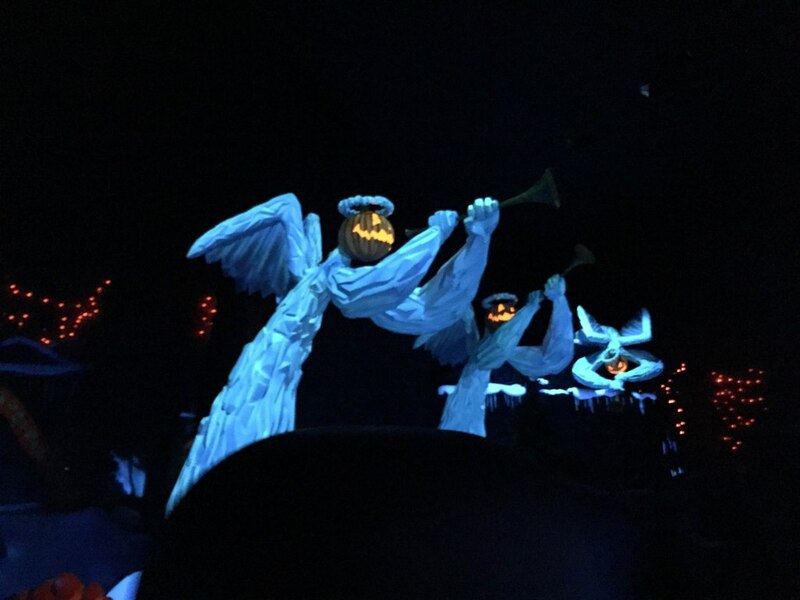 Third, Mr. BFT isn’t super into the whole Halloween and Disney thing, and I know I could go with a group of friends but it just never worked out … until now! I’m so happy my friends Valerie and James invited me to attend the party with their family! When I heard they were going to dress up as Big Hero 6 characters, I made plans to wear my Baymax hoodie I got at the press event last year. 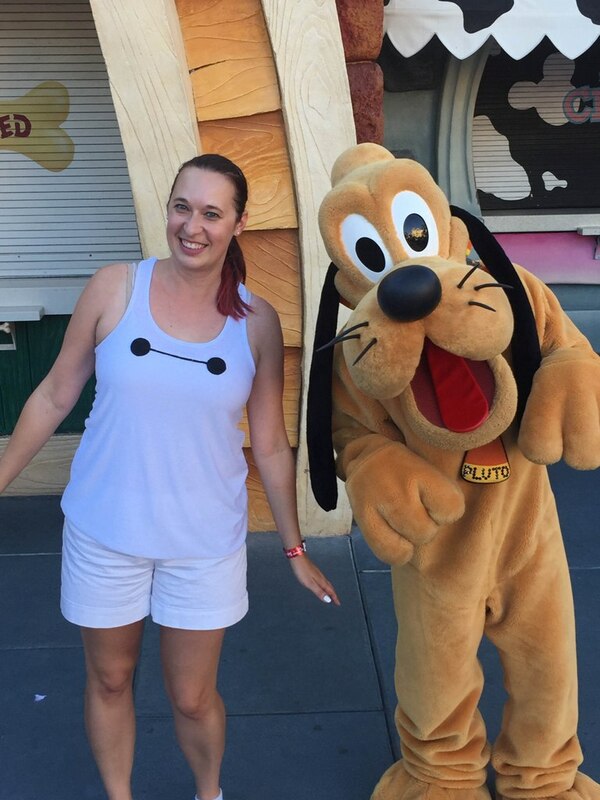 But in true So Cal fashion, the weather was in the 90s that day, so I quickly whipped up a Baymax tank top using my Save the Goats running tank top and some black felt. It was falling apart by the end of the night, but it worked well enough! A lot of the Cast Members yelled “Hi Baymax!” and literally every single character I took pics with wanted to do the Baymax fist bump. It was really fun! 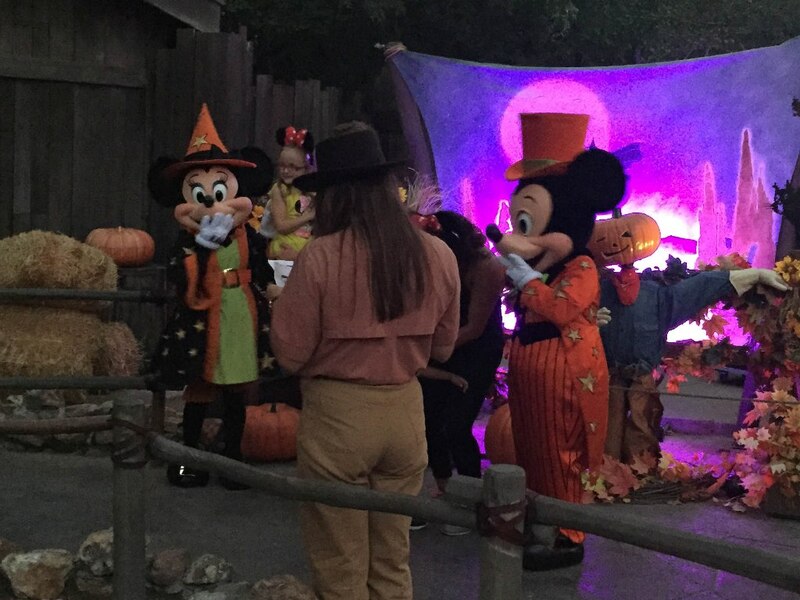 I want to go back to the misconception that Mickey’s Halloween Party is only for kids. Kids will enjoy the party, of course, but there is PLENTY for adults to do as well! Once the kiddos in our group started falling asleep, my friends returned to their hotel room and I enjoyed the park by myself until they kicked me out. 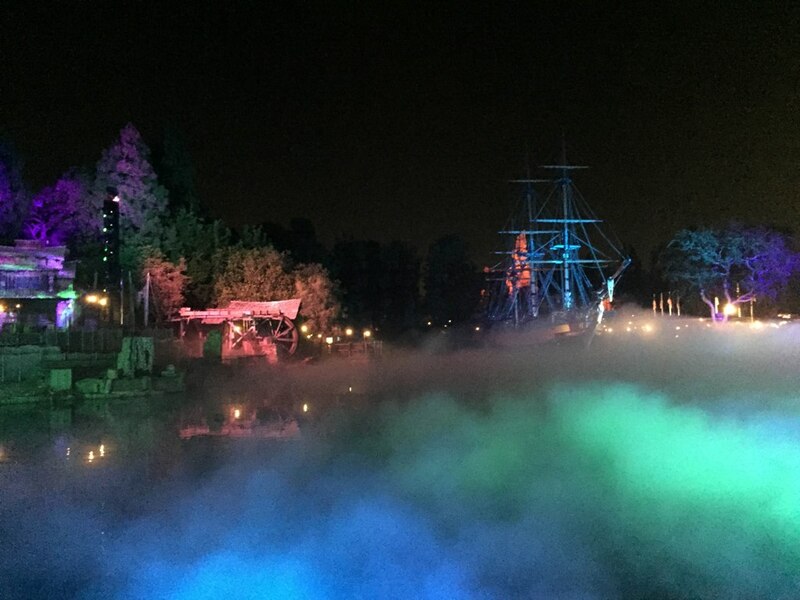 Even still, there was so much I missed out on, like the Cadaver Dans performing on the Rivers of America, and meet-and-greets with the villains. 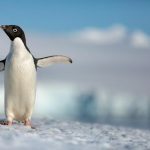 I decided to break this post into categories so you can easily find the information you are looking for. 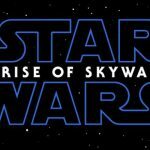 If you have any questions about something that isn’t covered here, please leave a comment and I’ll do my best to try to answer! Arrive early! 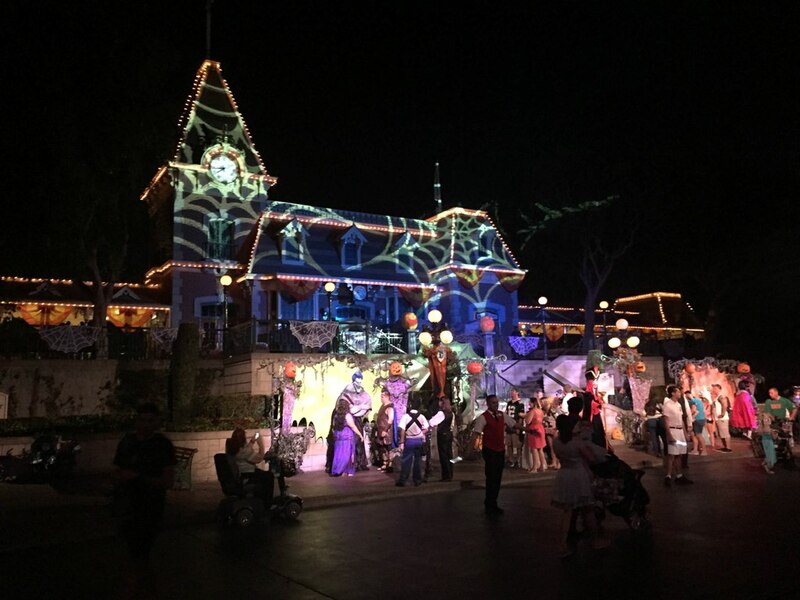 Your Mickey’s Halloween Party ticket allows you to enter Disneyland Park three hours before your scheduled event time, so take advantage of it. 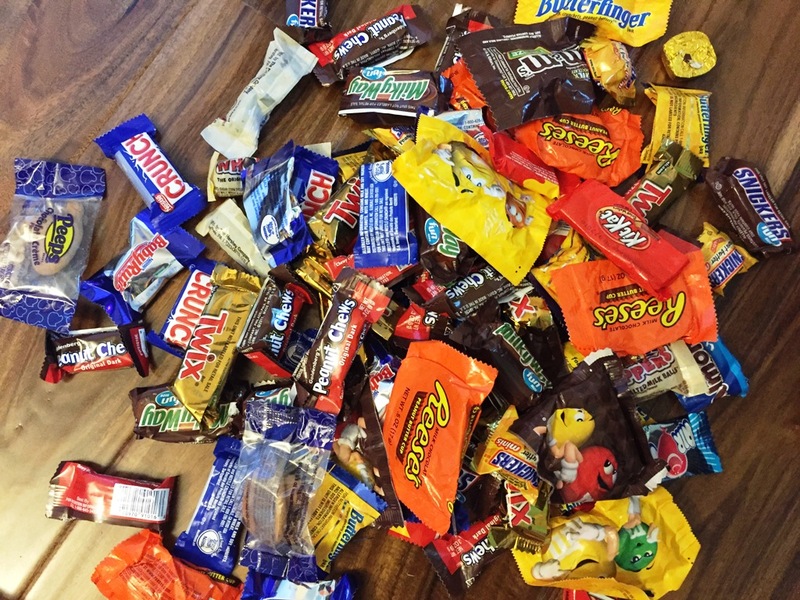 Bring a backpack, large bag, or pillowcase for trick or treating. You are given a bag when you walk in but it’s tiny, and insufficient for the amount of candy you are going to collect. I’m happy I brought a backpack, so towards the end of the night I could dump my candy in there and not have to carry around a heavy bag. 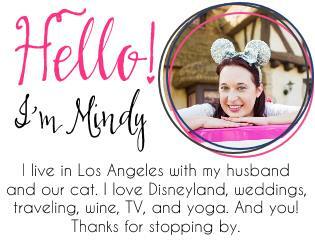 Head to Toontown first. 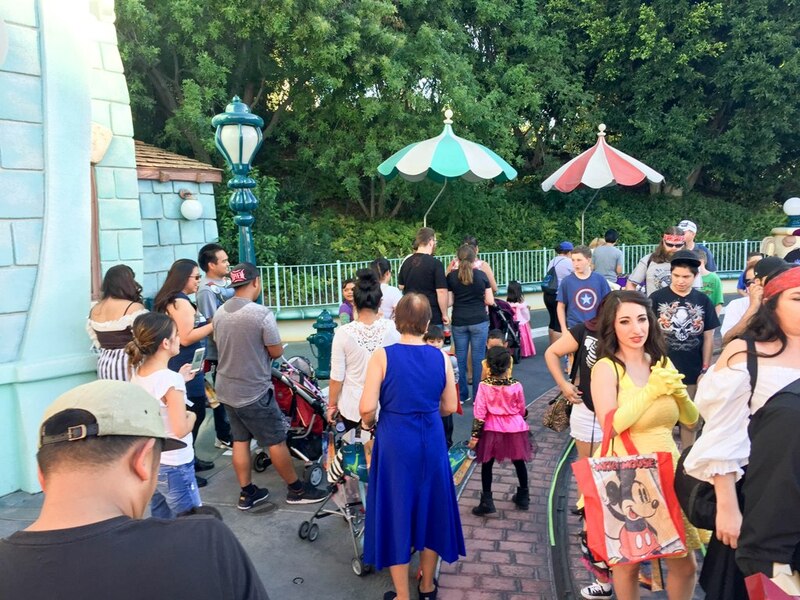 Toontown opens for the Halloween party one hour before the rest of the park. 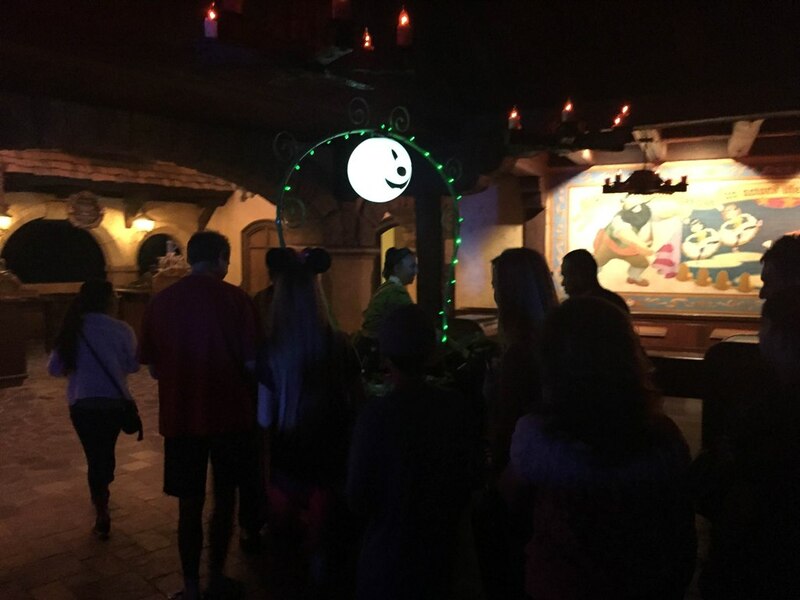 During our early hour in Toontown, we went through three trick or treat trails and waited in line for pictures with Mickey and Minnie. 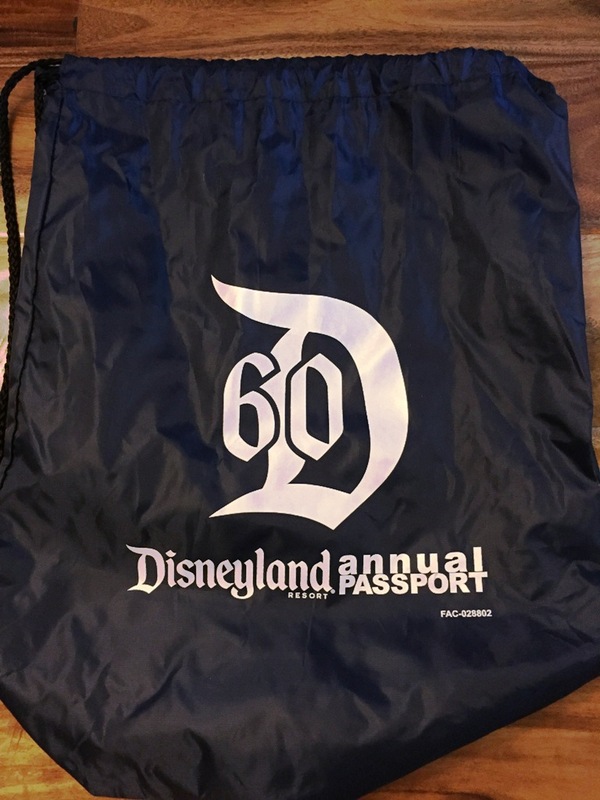 If you’re an Annual Passport holder, head to the Opera House (Great Moments with Mr. Lincoln theater) for a special treat, a Disneyland 60 backpack and a rice krispie treat. They don’t start handing these out until the official party start time (6pm or 7pm, depending on your night) and they do need to scan your pass, so make sure you bring it with you even though you don’t need it to enter the party! 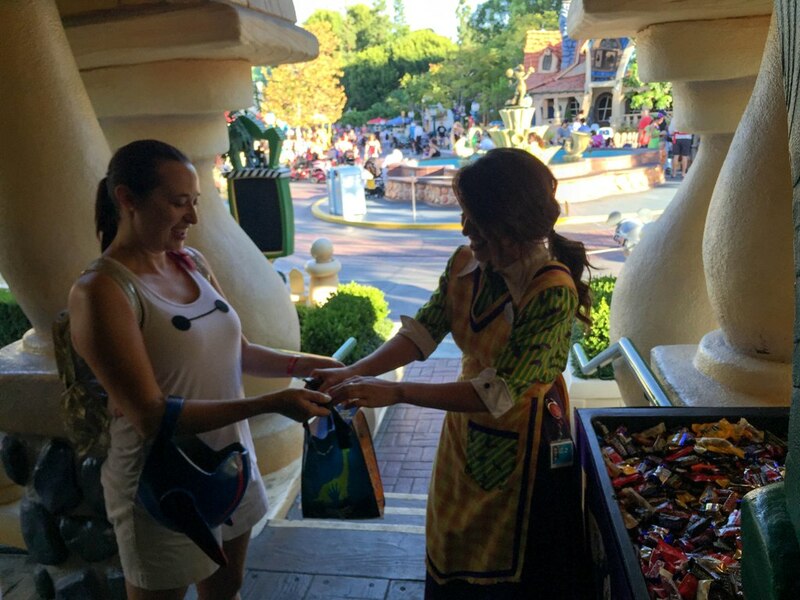 Perhaps the greatest draw for Mickey’s Halloween Party is the trick or treating, and yes, adults can do it, too! On the map I count 10 trick or treat trails, but in reality I think there are more than that. For example, there were three trails in Toontown that aren’t even shown on the map. 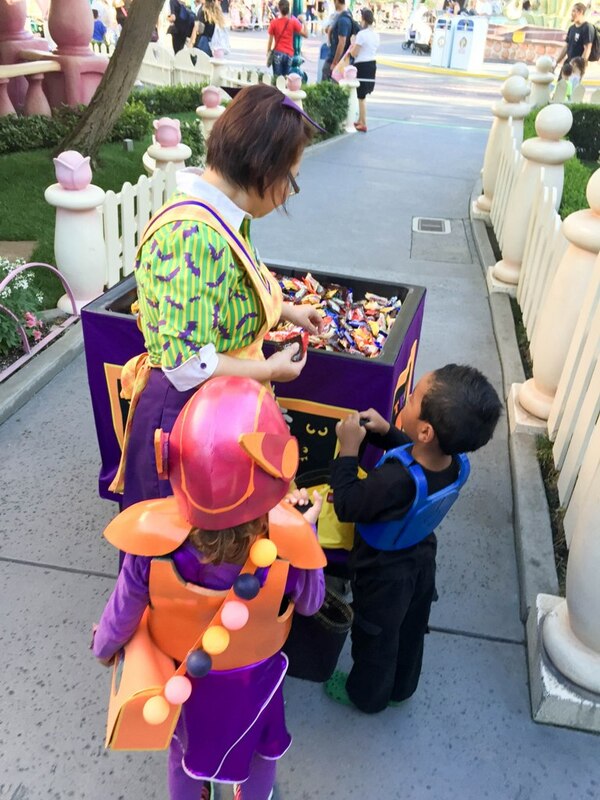 Each trail has four or five candy stations, and most stations also have a “healthy” option you can request, which included either baby carrots, natural potato chips, Craisins, Goldfish crackers, pretzels, or apple slices. There may have been additional healthy options but those are the ones I remember off the top of my head. Someone asked me if the lines of the treat stations were long. We walked right up to some and waited up to 10 minutes for others. Towards the end of the night, I noticed the lines were very short (and I also heard that at the end of the night, they practically dump handfuls of candy into your bags just to get rid of it). In the picture below you can see the free bag they give you when you walk in. I didn’t try any of the special Halloween food. 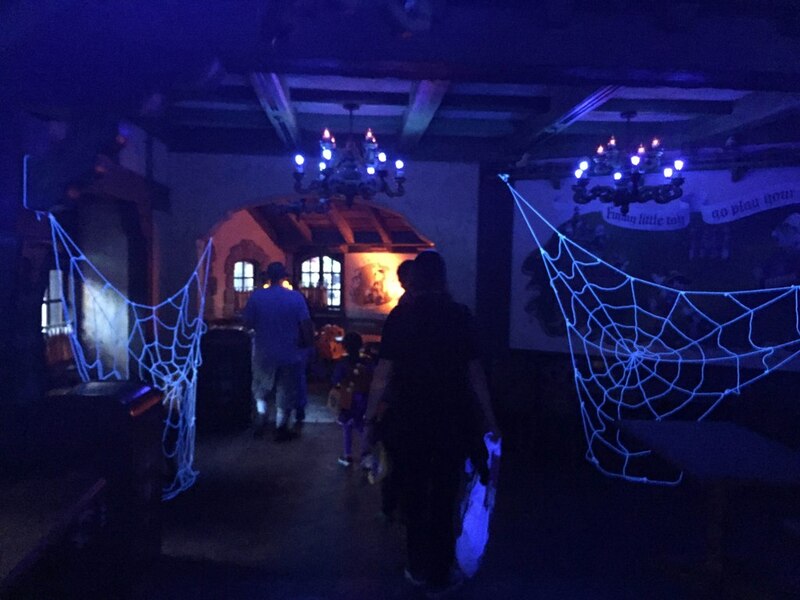 We ate at Stagedoor Cafe in Frontierland and I didn’t notice anything special on the menu, even though it’s marked on the map as having “special Halloween themed food.” I want to point out that some restaurants are closed during the Halloween party. 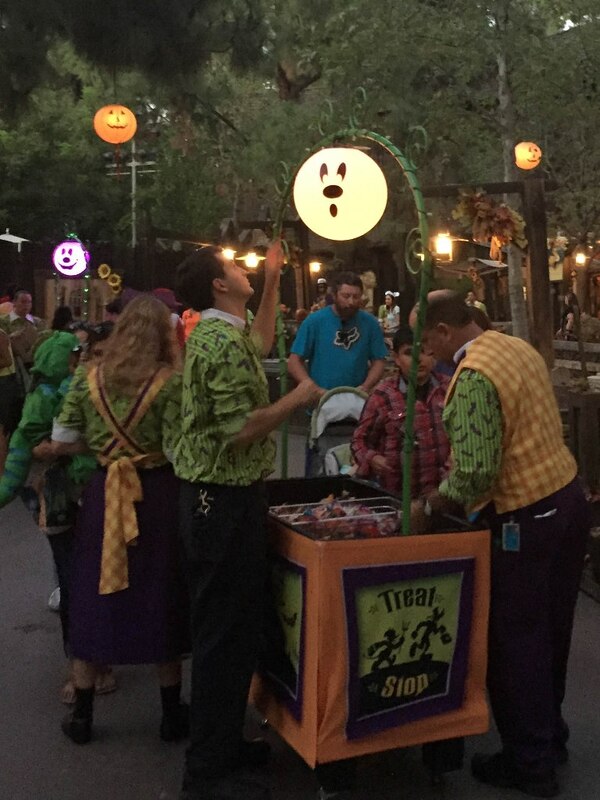 We had a bit of a frustrating experience when we decided to eat at Village Haus only to find it was turned into a trick or treat trail. 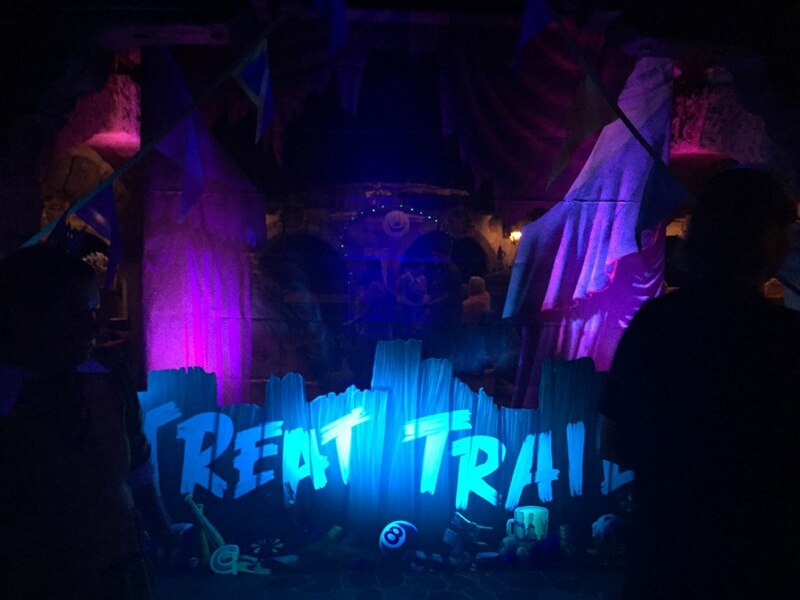 Then we went over to Golden Horseshoe – which was also converted into a trick or treat trail. Womp womp. We checked the map at that point. 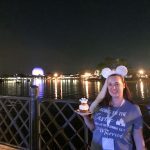 As far as I know, these special foods highlighted on the Disney Parks Blog are available ’round the clock at Disneyland, not just for Mickey’s Halloween Party. I can’t eat most of it, but I encourage you to try one of everything. 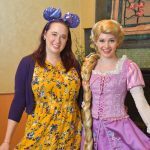 I’m a sucker for special costumed characters! 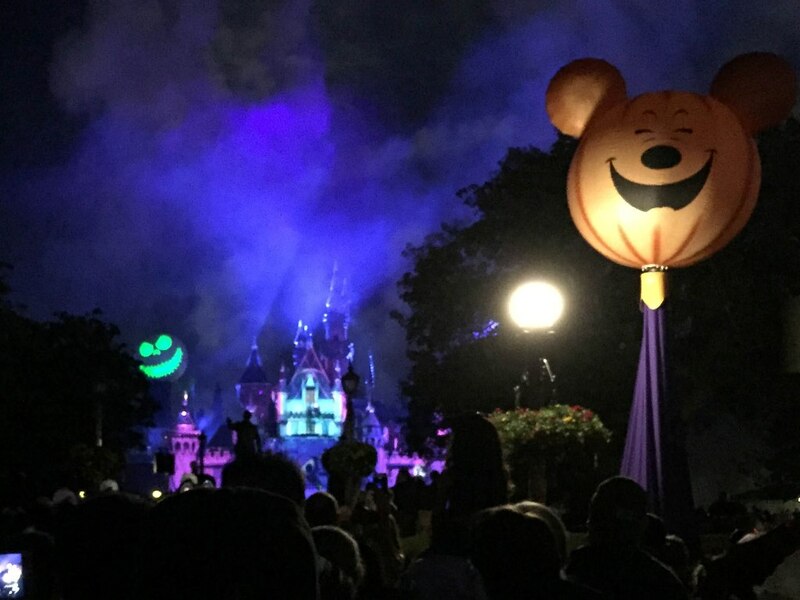 I saw two sets of Halloween Mickey and Minnie, plus Chip and Dale in their cops and robbers costumes, Donald, Daisy, Goofy, and Pluto in special Halloween garb, Woody and Bullseye (!!! ), lots of rare villains including Hades and Ratcliffe, and Pirate Goofy and Pluto. Check the map for a complete list of characters. 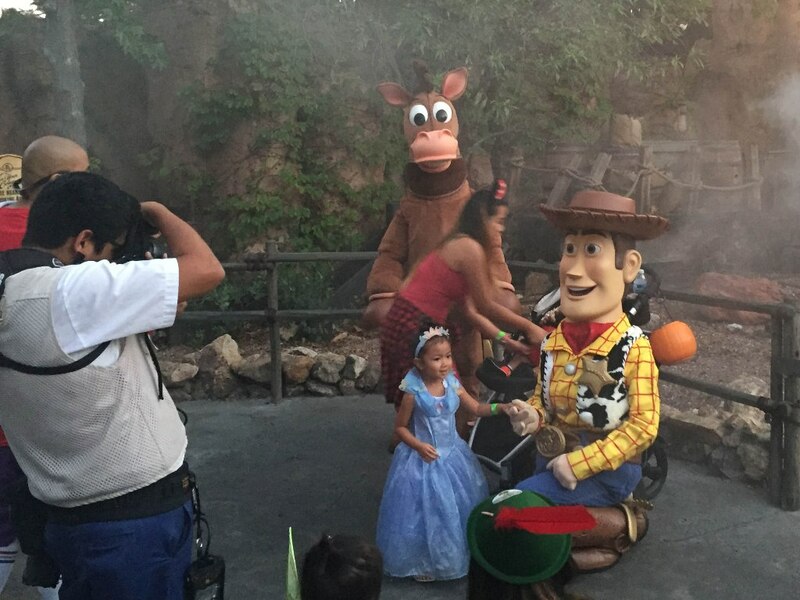 The best part of Mickey’s Halloween Party is the entertainment! 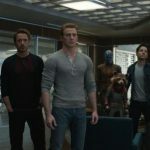 There’s SO much to see! 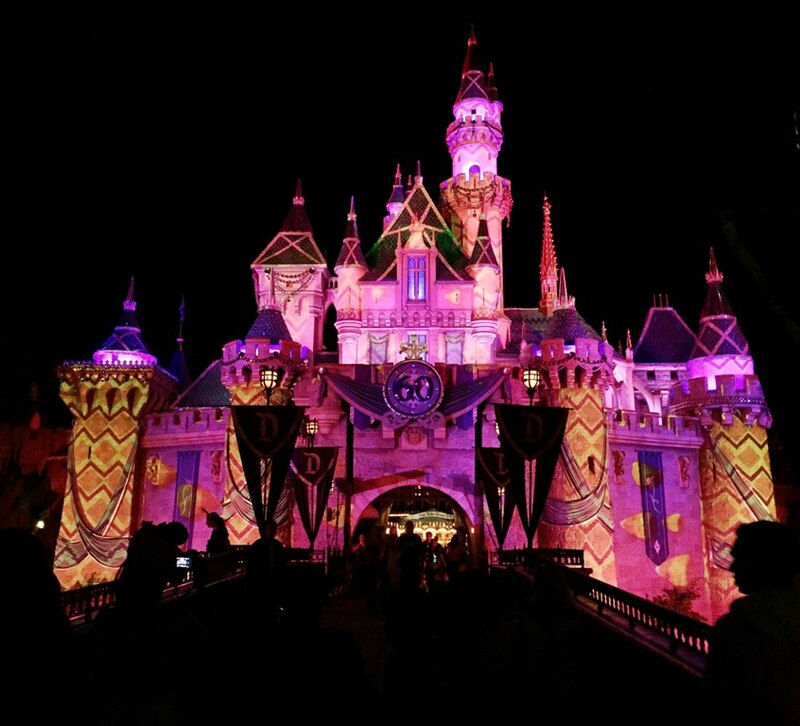 First of all, the entire park is transformed into a party atmosphere, with dance music pumped through the park and projection mapping all up and down Main Street USA and Sleeping Beauty’s Castle. 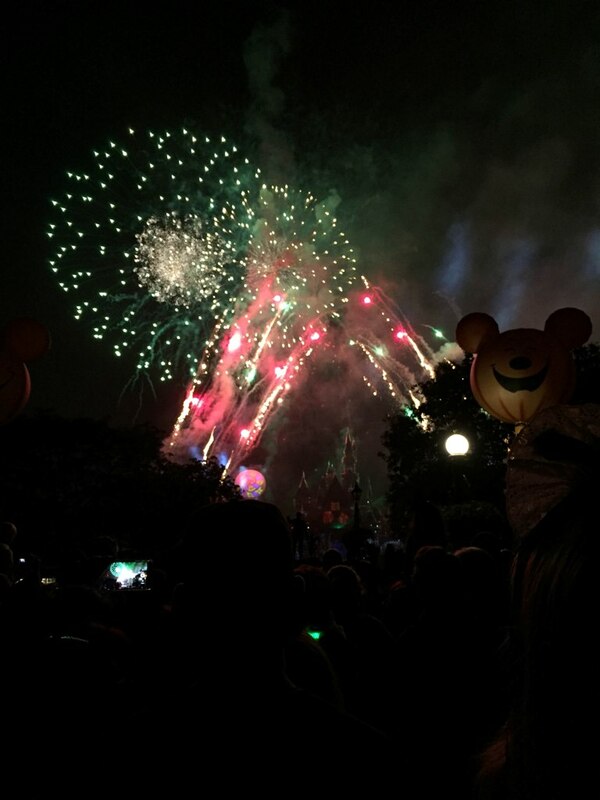 The special Halloween Screams fireworks show is a must-see. 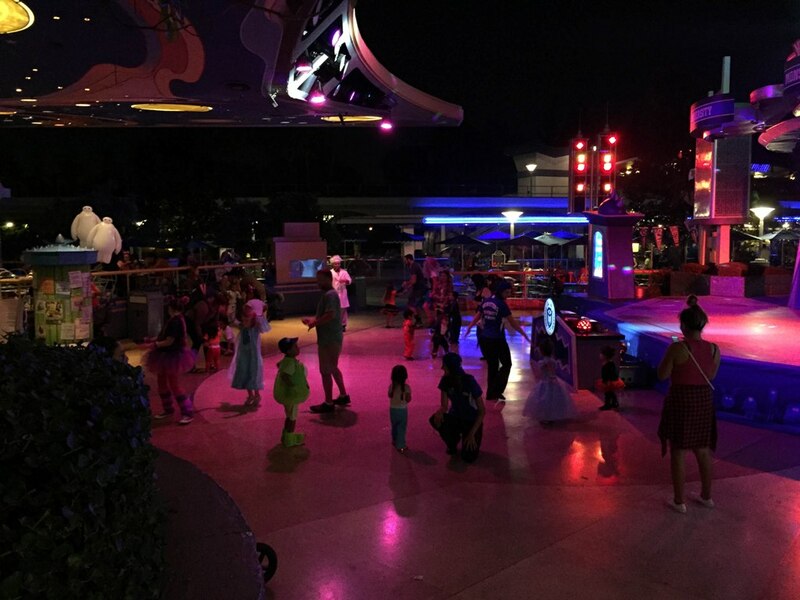 There is no special Halloween parade this year, but party-goers are treated to a performance of the popular Paint the Night parade. 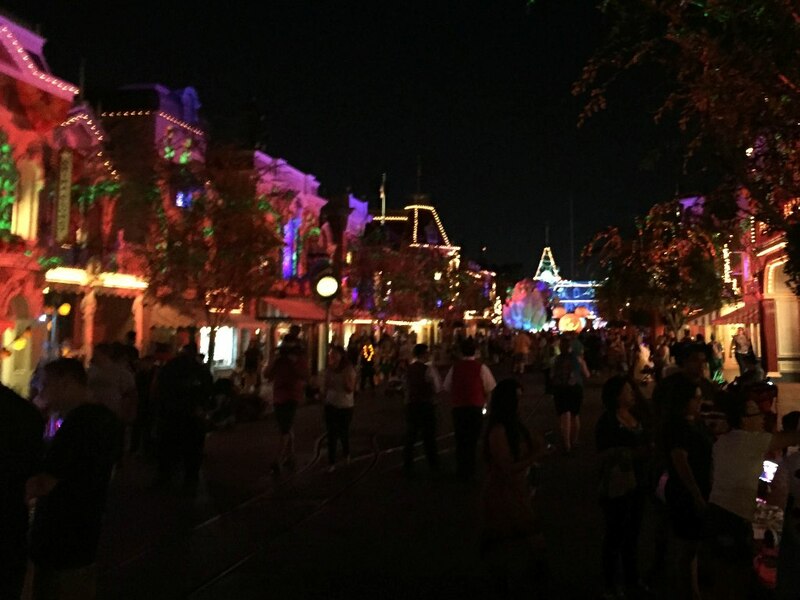 There are talking scarecrows in Frontierland, Cadaver Dans floating on the Rivers of America, a Monsters U dance party in Tomorrowland, and you can’t miss the special villains Kiss Goodnight at the Main Street USA railroad station as the park is closing. 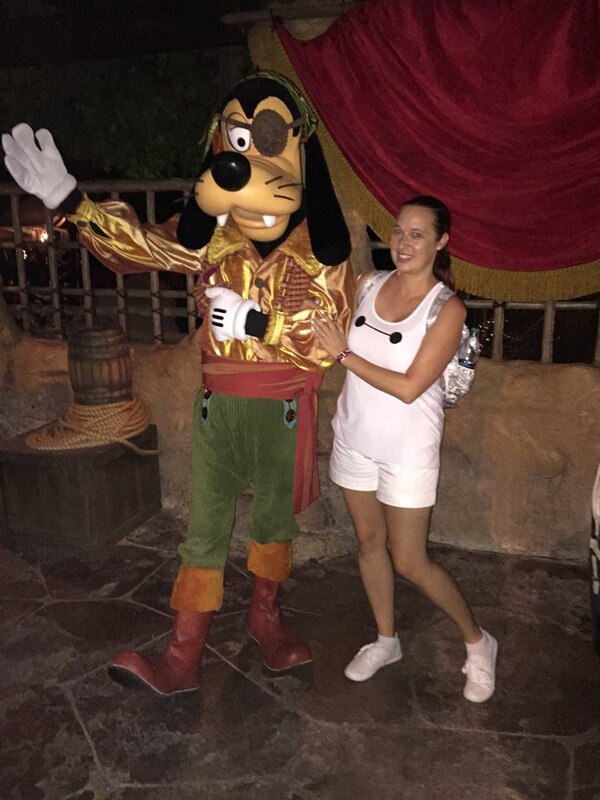 I hope you enjoyed this recap of my experience at Mickey’s Halloween Party at Disneyland! This is on my “must attend” list every year from now on! 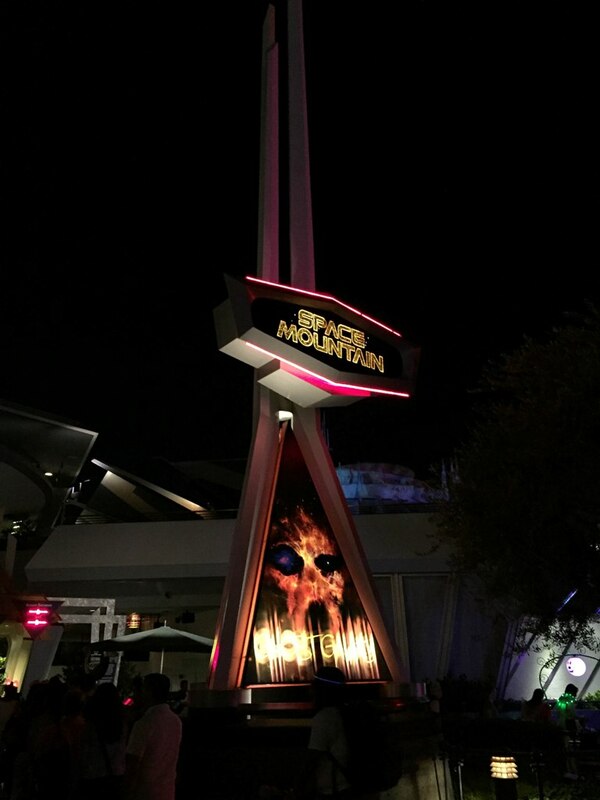 Mickey’s Halloween Party tickets are on sale now (although most dates are sold out by now), and don’t forget Annual Passholders get a discount on select nights. 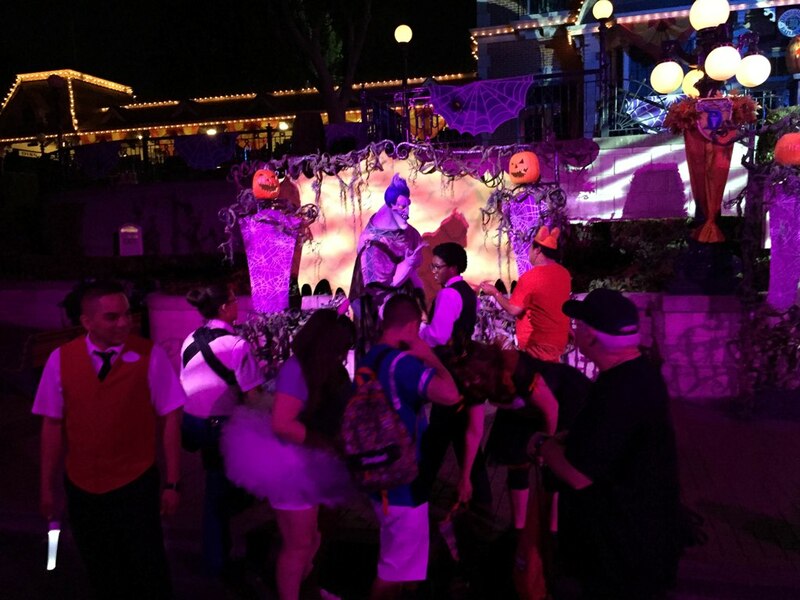 Have you been to Mickey’s Halloween Party? Do you plan to go this year?